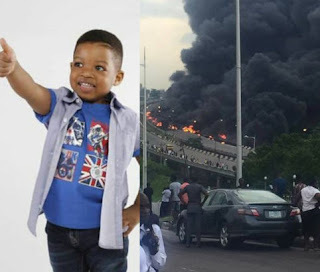 A 3-year-old boy identified as Eyitayo has been declared, following the tanker explosion which occurred at Otedola Bridge in Lagos State. 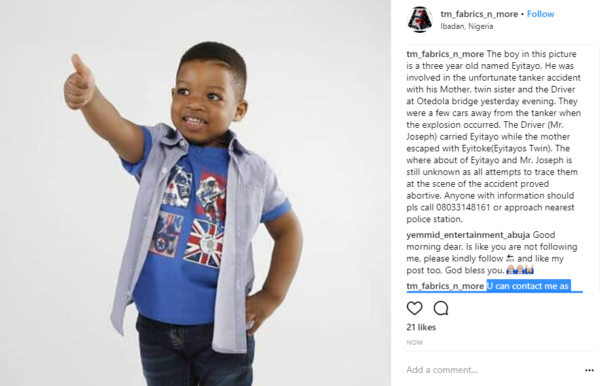 An Instagram user who shared the report, stated that the boy was with his mom and his twin sister in their car when the tanker explosion occurred. However the driver eloped with him, and their whereabouts is still not known. The boy in this picture is a three year old named Eyitayo. He was involved in the unfortunate tanker accident with his Mother, twin sister and the Driver at Otedola bridge yesterday evening. They were a few cars away from the tanker when the explosion occurred. The Driver (Mr. Joseph) carried Eyitayo while the mother escaped with Eyitoke(Eyitayos Twin). The where about of Eyitayo and Mr. Joseph is still unknown as all attempts to trace them at the scene of the accident proved abortive. Anyone with information should pls call 08033148161 or approach nearest police station. This is coming after a survivor of the incident, told Vanguard that they never envisaged that the truck would experience any brake failure.